I've really had gold wallpaper on my mind for some reason. I would love to add some gold accents to the wall behind my bed. I've really been thinking about what I want to do to that wall since it's the wall that makes the most sense in my house to use as some kind of crazy accent wall. I think the top 2 wallpapers are my favorites, but a little pricey for my budget, and the wall I'm thinking about is already painted over wallpaper so I don't know how crazy it might be to add another layer. Especially since I have no idea what I'm doing! 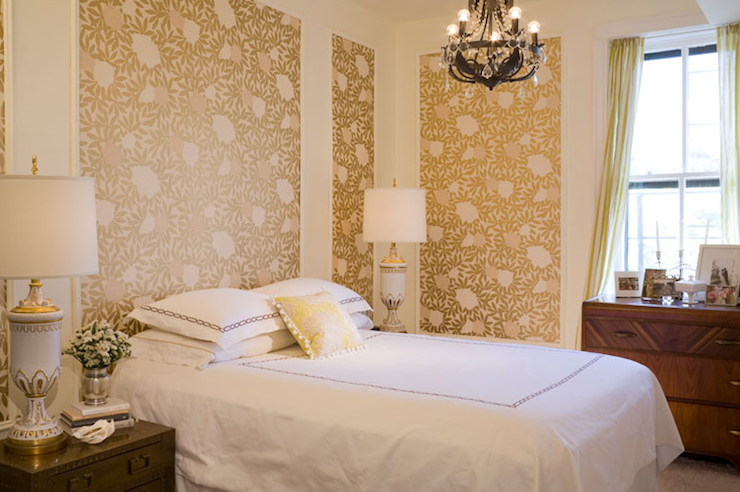 It's probably more realistic to put up some kind of panel(s) or use gold paint to paint a pattern directly on the wall. Then I could maybe do some kind of pattern for most of/the middle of the wall and some kind of crazy free-form thing as it spreads out? Hmm... I think I'll have to think a little more before I actually start this project. I LOVE, love the gold deer wallpaper, super fun! Visiting for the ModSquad group btw :) Cool blog! Hi Alyssa! Your blog is so cute!